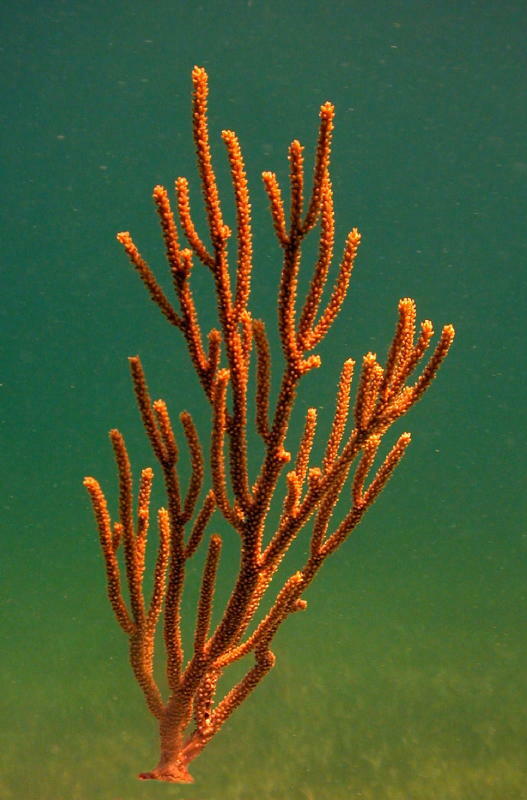 Muricea elongate, also known as Rusty Gorgonian is an attractive, hardy octocoral that thrives in some of the most adverse environments in the Florida Keys. They are usually a rusty, burnt orange color, but can sometimes be more yellow than orange. As with most shallow water gorgonian, this species is photosynthetic, so it will do best in a well-lit tank. Supplemental feeding with plankton, some sort of commercial invertebrate food, or your own mix of food will be necessary in order to maintain optimum health. This is a fairly hardy gorgonia and would be a good starter gorgonian if you want to start keeping them in your reef tank. There is quite a bit of natural color variation in this species but we try to send the most rusty orange color. Most gorgonians like currents, so keep that in mind when placing them in your tank. 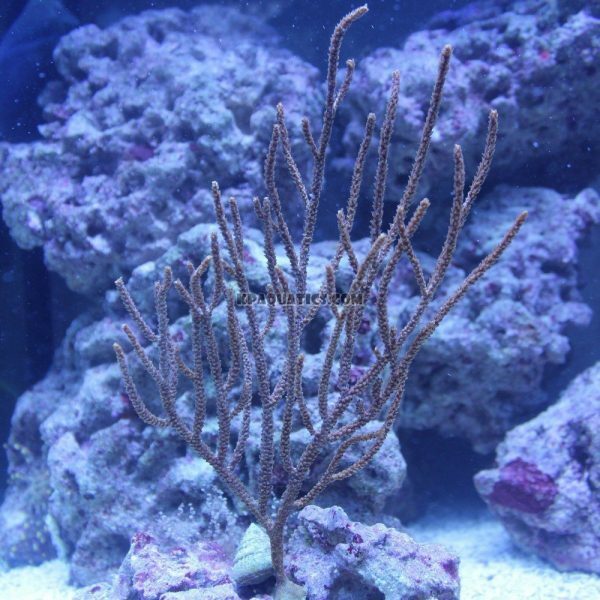 All of the gorgonians we sell have been kept successfully for many years in all kinds of reef aquariums and have passed the “test” for being suitable for marine aquaria. They are hardy, attractive, easy to care for, and will feed on must types of foods designed for plankton feeders. Because they are photosynthetic, they will derive much of their nutritional needs from the lighting in your aquarium, so they don’t require large amounts of supplemental food. Also, all of our gorgonian will have some sort of base to them, which you can mount onto a rock with super glue or epoxy. I prefer to use epoxy because it is less likely to fall off after a few months, but gel super glue works too. Most gorgonians can be safely pruned if they get too big, and the cuttings will grow and survive if mounted on something stable. 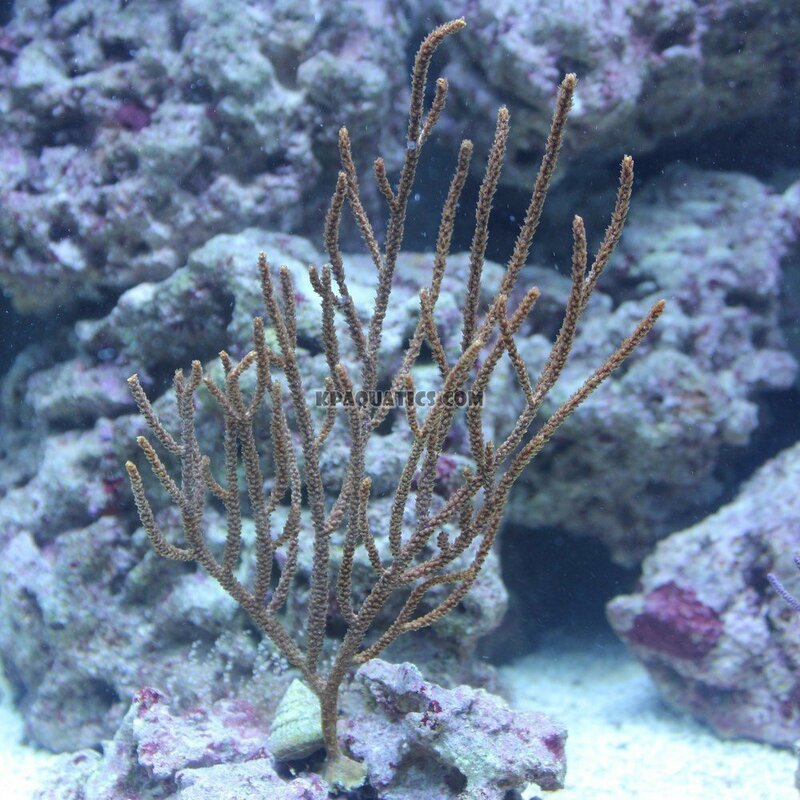 This particular gorgonia will actually develop new attachment holdfasts on branches that touch non-living things in your tank, so they are easy to prune and propagate. Great looking speciamen, can’t wait until it grows out. Wonderful piece! Much larger than expected. Healthy and fat with a little black sea rod hitchhiker attached at the base. I purchased another one of these over a year ago also a nice piece. It’s growth has been slow but steady and is doing well. These do not seem to shed or get algae on them like my purple blade gorgs do sometimes. I think they are one of the best gorgs for the aquarium. Received a nano-size version of this and I am floored by the color. Best representation for what I received would be the second pic. Super rusty-orange and totally pops next to my purple sea whip. Polyps were out in a day. BUY THIS if you love gorgs. i really like these gorgonians. They polyped up nicely and make a nice display. I put them in a lot of flow with some other varieties of gorg. It doesnt have flowery polyps like the other gorgonia I ordered, more of a cactus looking spikey look which I love! Very different and I highly recommend it! real nice specimen polyps opened immediately . highly recommend it. This gorgonia opened up only a few hours after I introduced it to my tank. It is very cool and definately one of my new favorites! Really cool. It fits the product description and picture perfectly. Perhaps even better. Thanks Ken! Excellent color and health, I have had one for about six months and just ordered another (and received an extra with my recent order). I love the way these look in my nano and have found that in contrast to some other small polyp corals I have tried to introduce to my tank, these spiny gorgonians don’t seem to attract the nipping of my pygmy angelfish. I am always so impressed with the quality of my orders from Ken and these gorgonians are no exception. Very nice definition and shape. This gorgonia was acclimated to 12g nano water in a seperate isolation container the first night to target feed. Excellent color and form! Just beautiful. If they grow as well as the purple plume gorgs I got a year ago — and I have no reason to think they won’t — I’ll be very happy indeed. Thanks, Ken! Wow, gorgeous gorgonian! I want to order another for my large display tank because this one looks so great in my nano! This coral adapted great to my nano reef and looks awesome! The size and form are perfect for our nano tank. It arrived in great shape, and the polyps were fully open the next day. It is a beautiful specimen. Great piece, adds lots of character to my display! Opened up almost immediately. The coral that I recieved was packaged very nicely. Ken really cares about the quality of his specimens! Beautiful specimen, its definitely a show piece and just the right size for a nano. Mine arrived well packed and polyped out in my tank almost immediately. Beautiful orange coloration. Ken packages these so that they won’t be exposed to air and dry out while being shipped. They arrived in perfect condition and had their polyps out the very same day. Awesome additions to a reef tank.